The 1st Pennsylvania Regiment, also known as the Pennsylvania Rifle Regiment and 1st Continental Regiment, was raised under the command of Colonel William Thompson for service in the Continental Army. The Congressional resolution of June 14, 1775 authorized ten companies of expert riflemen to be raised for one-year enlistments as Continental troops. Maryland and Virginia were to raise two companies each, and Pennsylvania six. Pennsylvania frontiersman, however were so eager to participate that on June 22 Pennsylvania’s quota of companies was increased to eight, organized as a regiment known as the “Pennsylvania Rifle Regiment.” A ninth company was added to the regiment on July 11. All thirteen companies were sent to Washington’s army at Boston for use as light infantry and later as special reserve forces. Seven companies of the regiment (1st, 2nd, 3rd, 4th, 5th, 8th, and 9th) were made up of mostly Scots-Irish; the 6th and 7th companies were mostly German, from Berks and Northampton counties. Their standard weapon was the long rifle, which had greater range and accuracy than the muskets used by most of the British Army and Continental Army, but less weight of shot, slower rate of fire, and were without bayonets, making the regiment unsuitable for line-of-battle. 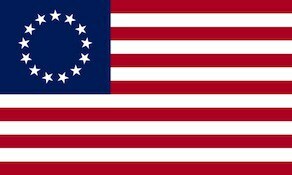 In 1776, when a new army was raised following the expiration of enlistments at the end of 1775, the rifle regiment, whose term of enlistment did not expire until July 1, as the first troops to enlist as Continentals, received the honor of being named 1st Continental Regiment. The regiment saw action during the New York Campaign, Battle of Trenton, Second Battle of Trenton, and Battle of Princeton. At the Battle of Brandywine the regiment was led by Colonel James Chambers and assigned to Colonel Thomas Hartley’s 1st Pennsylvania Brigade. Under the direction of acting division commander Brigadier General Anthony Wayne, the 1st Pennsylvania Regiment fought near Chadds Ford where it held the “post of honor”, the far right flank of the division. At the Battle of Germantown the regiment was brigaded with the 2nd, 7th, and 10th Pennsylvania Regiments. The unit again fought on the extreme right flank of the division just east of Germantown Road. Afterward, the regiment’s Major Henry Miller boasted to his family about how the division routed the British troops opposed to them and overran their camp. The 1st was in action at the Battle of Matson’s Ford on December 11, 1777. The unit also fought at the Battle of Monmouth in 1778 and the Battle of Springfield in 1780. Two companies, those of Captain William Hendricks and Captain Matthew Smith, accompanied Arnold’s expedition to Quebec and were captured in the Battle of Quebec. The regiment was furloughed June 11, 1783 at Philadelphia, Pennsylvania and disbanded on November 15, 1783. Company C of the 337th Engineer Battalion claims lineage from Captain Michael Doudeis Company of York, Pennsylvania of the 1st Pennsylvania Regiment.